North Andover High School’s field house was filled with residents for Tuesday’s town meeting on the proposed marijuana growing facility. NORTH ANDOVER — After more than two hours of heated debate, residents here voted to ban recreational marijuana facilities, effectively killing a contentious plan to turn part of the former Lucent Technologies plant into one of the world’s largest cannabis-growing and research facilities. 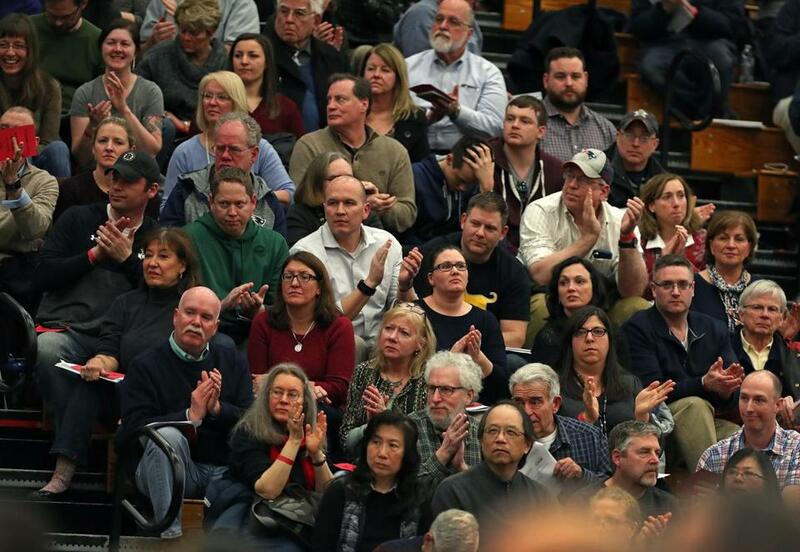 Opponents of the proposed $100 million “Massachusetts Innovation Works” project cheered as screens in the high school’s fieldhouse — packed to capacity with thousands of residents — showed the final count: 1,430 in favor of the ban to 1,155 against. The vote rendered moot other articles on the warrant that would have allowed the project to proceed, and proponents withdrew them. Representatives of Mass. Innovation Works declined to comment on what the decision meant for the future of the project, but it seemed clear it could not go ahead as currently conceived. Much of the debate at the Special Town Meeting focused on the economic and social value of the facility, which would have included a large commercial cultivation operation plus a research center. Residents will decide Tuesday whether to welcome one of the world’s largest cannabis growing and research facilities. Massachusetts Innovation Works, led by local doctor Jeff Goldstein, had promised to pay the town $100 million over 20 years, provided state regulators allowed the operation to reach its full size of 1.1 million square feet of the facility. Goldstein, who bought the former Lucent plant in 2003, estimated the operation at full scale could house 300,000 plants and would likely become the single largest supplier of dispensaries in the state. Up to 1,500 jobs could have been created at the facility on the Merrimack River, Goldstein said in his pitch. As the meeting stretched late into the night, residents and town officials debated whether North Andover should become the epicenter of the state’s nascent commercial cannabis industry. 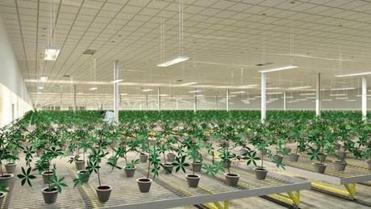 Some said the facility would conduct groundbreaking research into the medical benefits of marijuana. Others cited a windfall of tax revenue from the sale of thousands of pounds of pot to supply the state’s recreational marijuana dispensaries set to open in July. The Town Meeting vote represented the first step in what would have been a lengthy approval process. The state would have had to OK the facility, along with other town boards. The project was presented to voters for the second time in less than a year. Last spring , the project drew strong support, but ultimately fell short of the necessary two-thirds majority vote to allow the facility. Since then, a shift in federal marijuana policy and the state’s ongoing implementation of the marijuana law, along with the massive compensation package offered by the facility, have lent new urgency to the matter.